Jiqiang Tong raises to 700,000 on the button and Will Failla shoves all in for 3,375,000. Tong calls and the players table their cards. The flop comes 10♥8♦6♣ giving Tong top pair and giving Failla two pair. The turn is the 9♦ and the Tong calls for a seven on the river but it's the q♣ that arrives, and Failla doubles up. Will Failla and Jiqiang Tong have reached a chop deal. Failla will take $65,151 and Tong will take $74,000. They will continue play in just a few minutes for the trophy. Gennadiy Koslov was just eliminated by Jiqiang Tong in 3rd place after Tong rivered queens full of aces. The remaining two players are now heads up and talking about a chop. 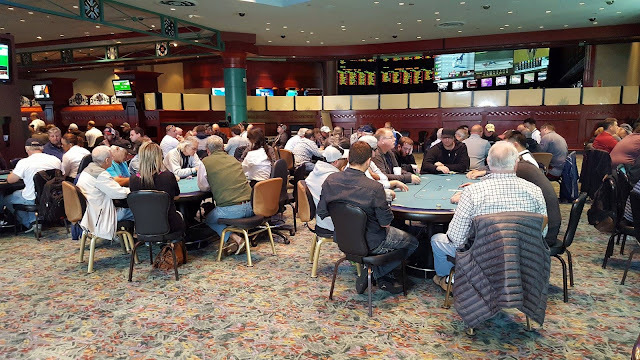 There were a total of 390 entries in today's Event #5, generating a prizepool of $98,358. Will Failla is all in again, this time for 2,300,000, and Jiqiang Tong has called in the big blind. The board runs out J♦6♥7♦3♥Q♠ and Failla says, "Yesss...I just love hitting the river on this guy." Will Failla is all in from the small blind for 1,625,000, and Jiqiang Tong has called in the big blind. 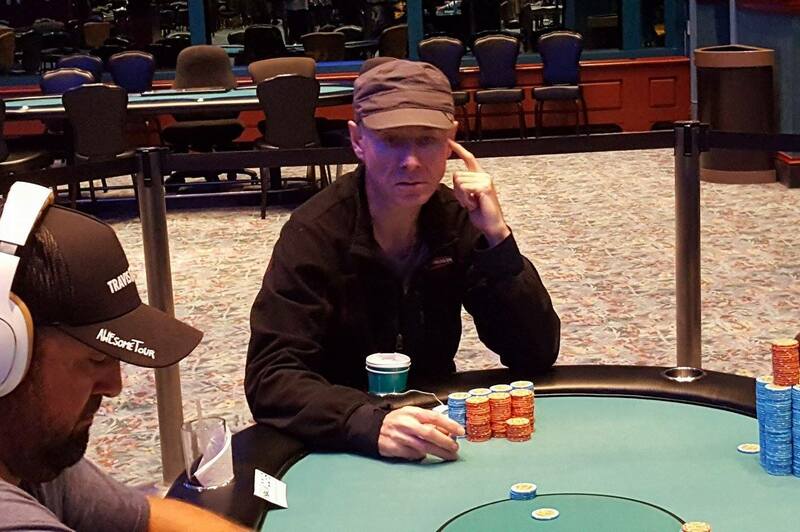 The flop comes A♥A♦5♦ leaving Tong in the lead with aces and sevens. He maintains that lead when the turn comes the 3♥. But the 9♦ river gives Failla a bigger two pair to double. Action folds to Jiqiang Tong in the small blind who shoves all in, and John Hutchinson snap-calls in the big blind for his remaining 2,500,000. Hutchinson shows Q♣Q♦ and Tong turns over A♣10♠. "Nice hand," Tong says to Hutchinson before any cards are dealt. The flop comes A♦J♥7♣ giving Tong the lead with a pair of aces, and the K♥ turn maintains that lead but also gives Hutchinson a straight draw. Unfortunately for Hutchinson the 7♥ river does not improve his hand and Hutchinson is eliminated in 4th place taking home $26,994. Edwardo Berte Da Rocha shoves all in for around 1,300,000, and Gennadiy Koslov calls. Rocha holds A♦A♣ against Koslov's Q♣J♠. The flop comes K♠K♣Q♦ giving Koslov a pair of queens, but leaving Rocha int he lead. 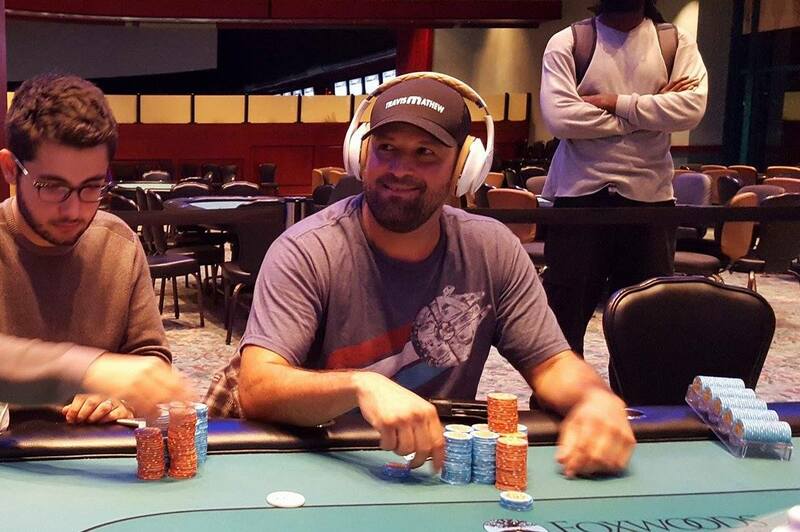 The 6♦ turn maintains that lead, but the Q♥ river gives Koslov a boat, and Rocha is eliminated in 5th place. He stands up, shakes hands with all of the remaining players, and heads to the payout desk to collect his $20,859. A few moments ago Jiqiang Tong won a massive pot against Gennadiy Koslov to take the chip lead after he turned two pair (kings and queens) against Koslov's top pair (he held King jack). 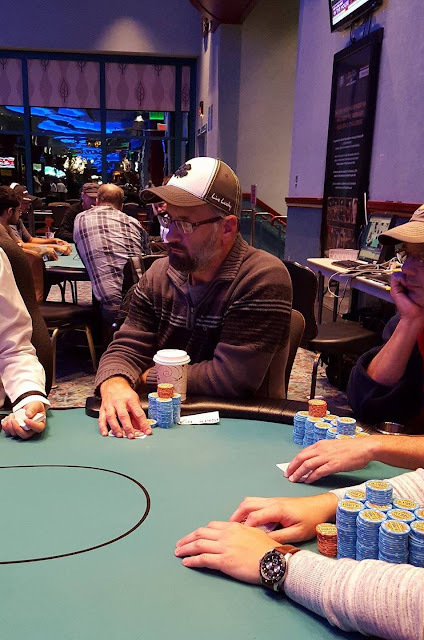 Just two hands later John Hutchinson was put to the test on the river in a 1,300,000 chip pot, and tanked for three full minutes before calling Edwardo Rocha's shove for his tournament life. Rocha showed K♦3♠ on a 6♦4♦4♠J♠A♥ board, and Hutchinson's J♦9♣ was good. Brian Metter shoves all in for his remaining 1,100,000 in chips in late position and Will Failla calls in from the big blind. The board runs out 6♥5♥3♦7♦J♣ only improving Failla's hand to trips on the river, and Metter finishes in 6th place. 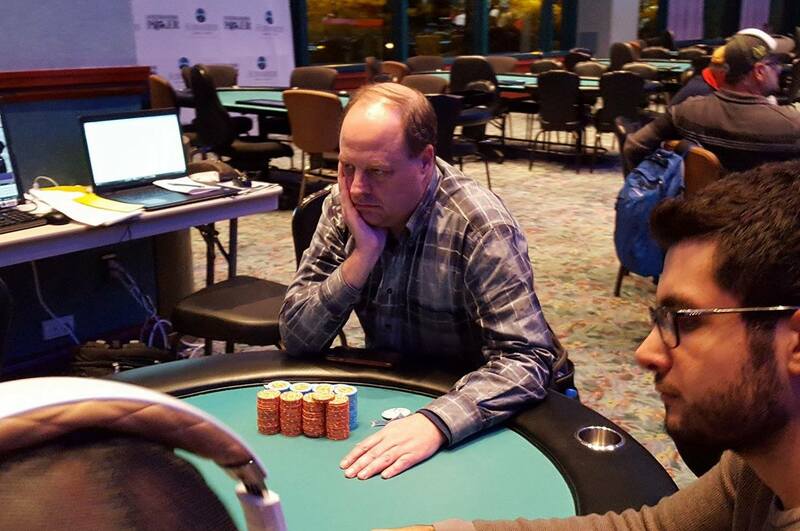 Edwardo Rocha raises to 240,000 in middle position and Steve Hammond shoves all in from the small blind for 450,000. The big blind folds and the players table their cards. The flop comes J♣9♠4♣ giving Hammond the lead with a pair of jacks, but the 9♦ turn gives Rocha trips to take the lead. The 2♦ river does not improve Hammond's hand and he is eliminated in 7th place. Gennadiy Kostrov raises to 300,000 in middle position and Joe Heinzmann shoves all in from the cutoff. The big blind asks for a count and upon hearing the 880,000 total, he folds. "How much more to call?" Kostrov asks. The dealer tells him it's an additional 580,000 to call, and Kostrov moves the chips forward. "King five huh? I like your hand," table mate Will Failla says to Kostrov. 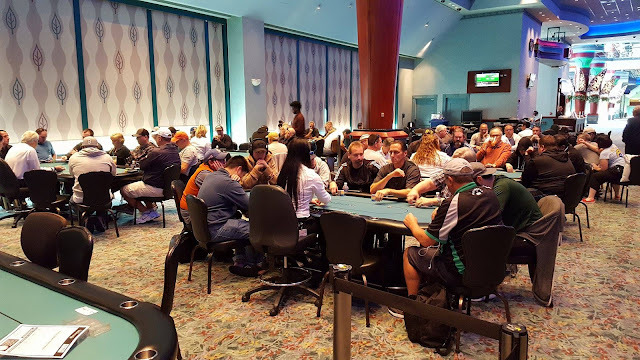 The flop comes 8♦7♦6♦ and Heinzmann says, "Ahhh man, not even a sweat," as he stands from his chair and starts to gather his belongings. The turn is the A♥ and the river is the 10♠ eliminating Heinzmann from play in 8th place. 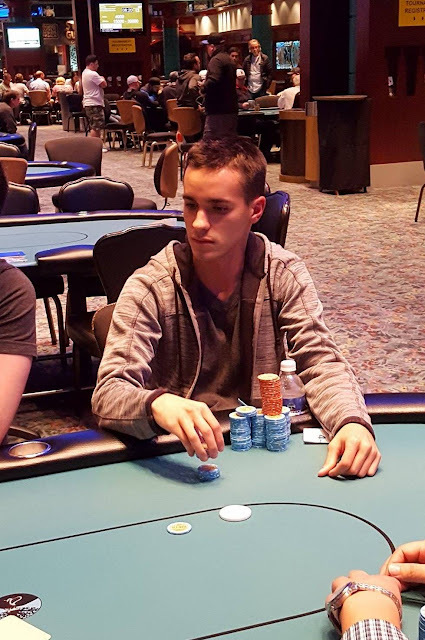 This is Heinzmann's second cash of the series in only two events played. The remaining seven players are now on a 15 minute break. They will return to play 60,000/120,000 blinds with a 20,000 ante. Here is how they stack up upon return from the break. John Hutchinson raises to 235,000 in middle position and Steve Hammond shoves all in from the big blind for 240,000. It folds back to Hutchinson who throws in the extra chip to call. The flop comes J♠10♦3♦ giving Hammond the lead with two pair, but also giving Hutchinson a straight draw. Fortunately for Hammond the 7♥ turn and 4♠ river are safe, and he takes the pot and doubles up. Facing a raise from Steve Hammond in middle position, John Hutchinson shoves all in for 1,445,000 on the button, and Hammond calls. The board runs out K♦7♦3♠Q♣4♥ awarding Hutchinson a double up. Ahmet Bolat shoves all in holding Q♦J♥ in late position and has been called by Jiqiang Tong holding Q♠Q♣. 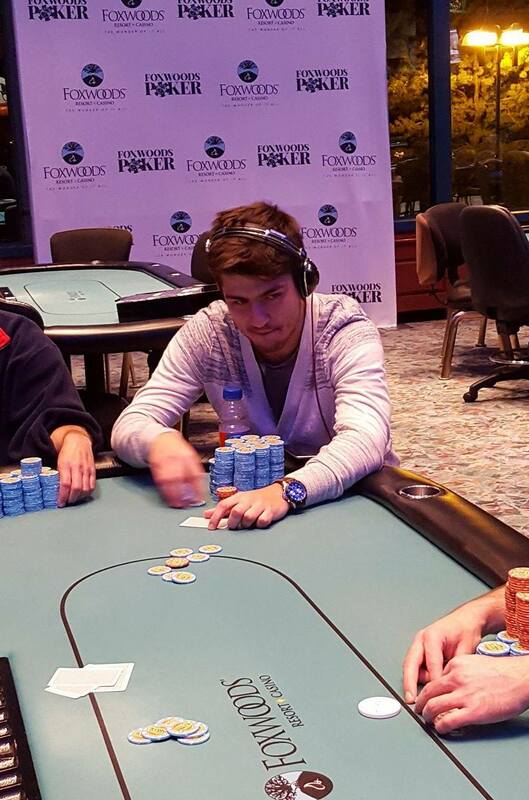 The flop comes J♦5♠4♣ giving Bolat a pair of jacks, but leaving Tong's queens in the lead. 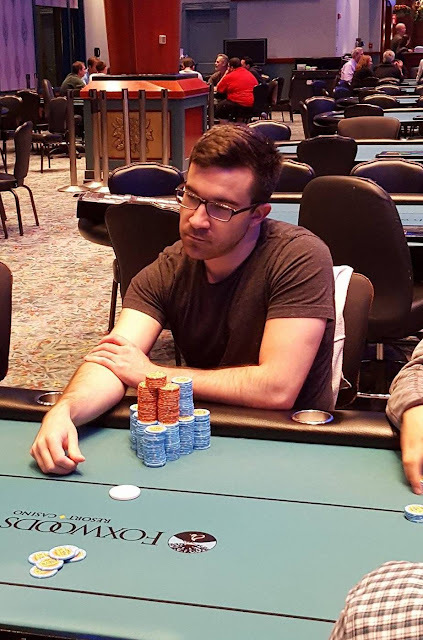 The 6♣ turn and 2♠ river do not improve Bolat's hand and he is eliminated in 9th place, taking home $8,147. The site that we run our live stream through (Twitch) is currently down. We will keep it monitored and let you know as soon as it's back up and running. The last hand before the break, With nearly a million chips in the pot and a board reading J♠7♥4♦ John Hutchinson bets 450,000 in the big blind and Jiqiang Tong announces that he is all in on the button. Hutchinson asks for a count, eyes Tong's stack, and then as the dealer starts reaching for Tong's stacks, Hutchinson mucks his cards. The cutoff raises to 2,500, and Patrick Jackson calls in the small blind, and the big blind also comes along. The flop comes 6♣6♦4♠ and it checks around. The turn is the Q♦. Jackson leads for 5,000, the big blind calls, the cutoff reraises to 12,000, and Jackson shoves all in for around 60,000. The big blind thinks for a bit before folding his hand, and the cutoff quickly calls. The big blind tells the table that he folded pocket fours (a full house) and the table erupts in side conversations as the river comes the 3♠. "He could have had pocket queens," the big blind says in defense of his fold. Jackson doubles up, and discussion regarding the big blind's fold continues well into the next few hands. Gennadiy Kostrov raises to 200,000 from under the gun, and Dave Gunas calls in the cutoff. The flop comes 9♠7♦6♥. Kostrov bets 500,000, and Gunas announces that he is all in for around 1,300,000. Kostrov snap-calls and the players table their hands. The 3♣ turn is safe for Gunas, but the 5♣ river gives Kostrov the straight, eliminating Gunas from play in 10th place. Monster Field and Growing in Monster Stack Event #5! All players wishing to enter/re-enter the $50,000 Guarantee Monster Stack event have until the start of Level 12 to do so. 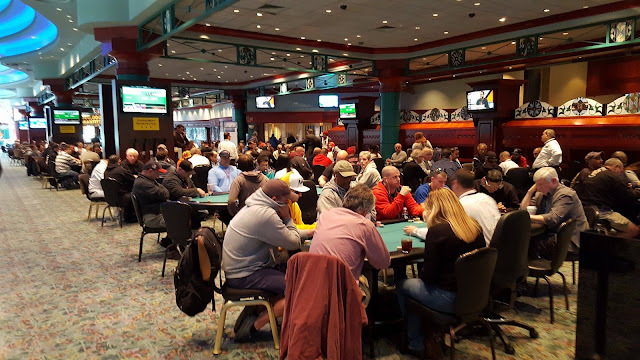 Players start with a 40,0000 chip stack and levels 1-15 are 30 minutes, and increase to 40 minutes at the start of Level 16. Structure sheet can be found by clicking this link. Facing a raise from Ahmet Bolat in late position, Mark Checkwicz shoves all in, and Bolat calls. The board runs out Q♣Q♠9♠7♥A♥ giving Bolat two pair (aces and queens), and eliminating Checkwicz in 11th place. The remaining ten players will now redraw for their seats at the final table. The final 11 players have just taken their seats for the final day of Event #1. After one player is eliminated the final ten will redraw to play the unofficial final table of ten. We will bring you a list of new seating assignments and chip counts after the redraw. Play will resume for the remaining 11 players at 12:00 noon on Wed. Oct. 5th at Level 28 (25,000/50,000 blinds and a 5,000 ante). 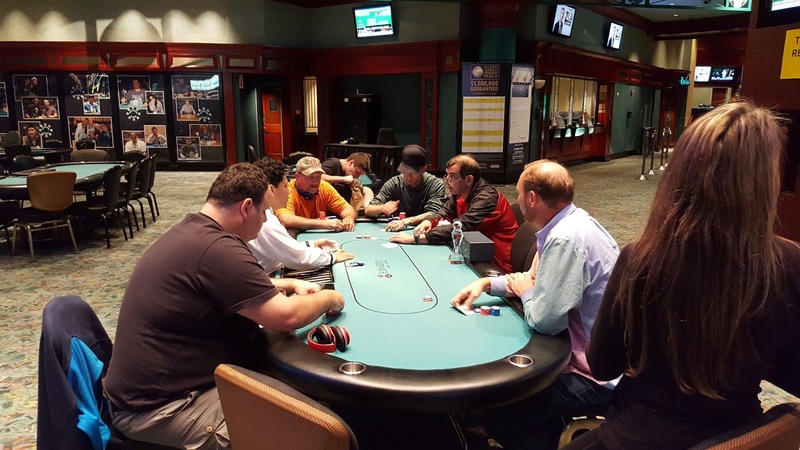 After ten levels of play, the final 11 players have just bagged up their chips for the night, and will return tomorrow at 12:00 noon to play down to a winner. 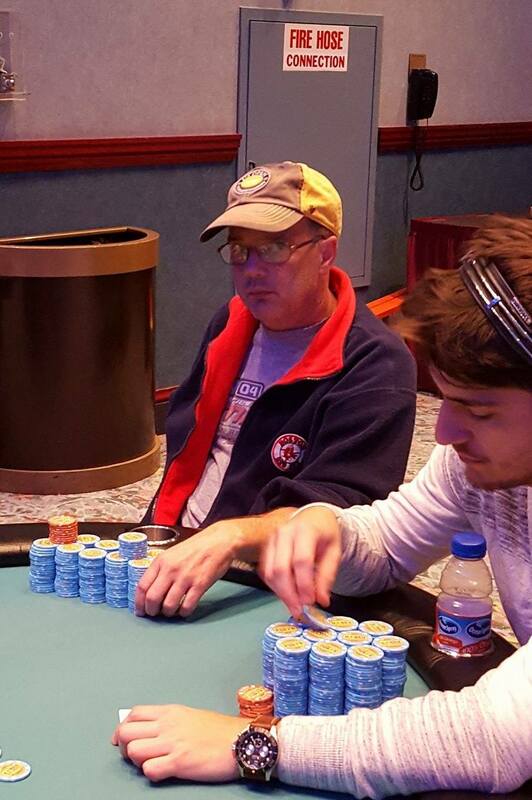 John Hutchinson leads the pack heading into Day 3, having ended today with 2,765,000 in chips. Joe Heinzmann is hot on his heels with 2,645,000, and rounding out the top three is Jigiang Tong with 2,095,000.